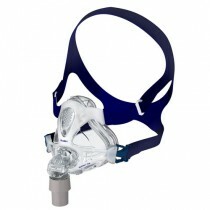 CPAP Full Face Masks are used to treat Respiratory Patients with Sleep Apnea. A full face mask covers the nose and mouth to allow continuous positive airway pressure (CPAP) therapy both nasally and orally. The positive pressure keeps the airway open while the patient sleeps. Patients that use CPAP therapy protect themselves from many illnesses that can result for sleep apnea. The list of these illnesses include snoring, intellectual decline, daytime sleepiness, fatigue, obesity, respiratory discorders, diabetes mellitus, hypertension, and heart disease. 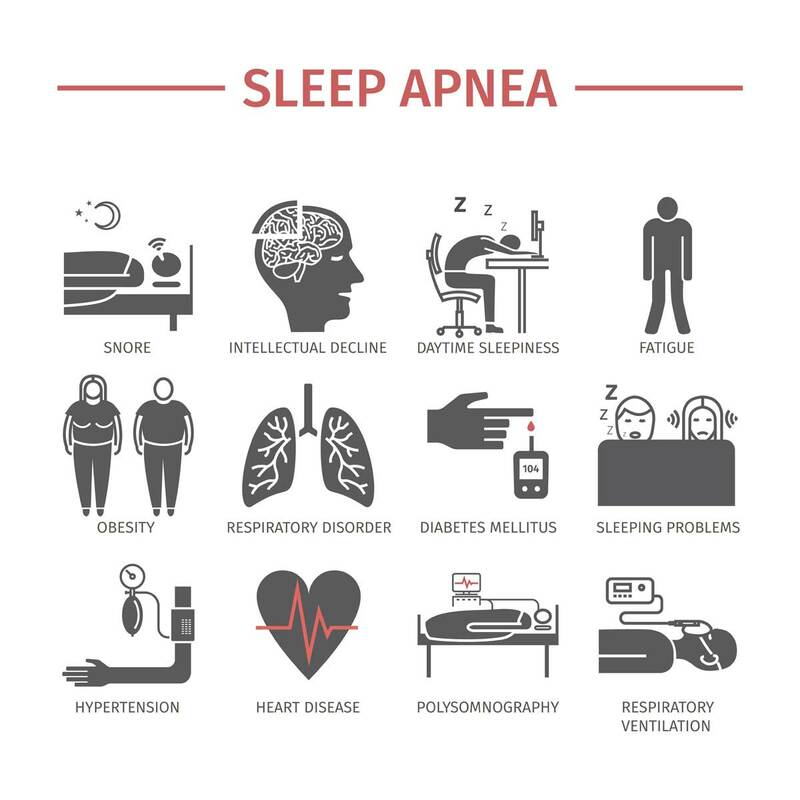 By keeping the airway open throughout the night, sleep apnea patients get better restful sleep and increased protection from these illnesses. 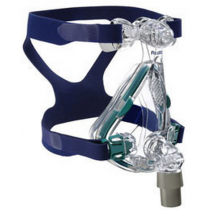 The image above displays the same ResMed Full Face Mask different angles. Also displayed is the headgear attached and unattached to the mask. Headgear and their attachment points vary from mask-to-mask. The common element between these types of masks is that they encompass the nose and mouth to provide oxygen to both airway passages. Although a new development in CPAP masks, called the Hybrid, also delivers air to the mouth and nose, the Hybrid does not come into contact with the bridge of the nose while the full face mask does in all of its versions. Patients with sensitivity to touch or pressure on their nose may want to consider a Hybrid Mask in lieu of a full face mask. 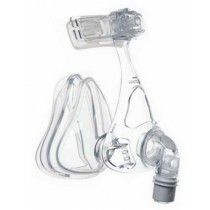 CPAP full face masks have some variations in their design. As displayed in the graphic above, traditional full face masks (located on the left) provide support located at the forehead. Headband securement is also located at the forehead. For some patients, the combination of mask frame and headband pressure on the forehead is very uncomfortable. 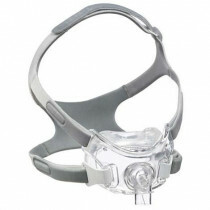 This sensitivity to forehead touch or pressure has made it difficult for some patients to comply with CPAP treatments using this type of mask design. The mask on the right has no support at the forehead. This variation accommodates patients who are sensitive to forehead pressure. Another noteworthy variation of full face masks are the those that offer low noise levels. The low noise feature offers more comfort to the patient and is less annoying to another person sleeping in the same room. Pictured above are some of the top selling full face masks. The two masks on the left, highlighted in pink, employ a mask frame that interacts with the patient’s forehead for support. Bands from the headgear connect to the forehead extension for additional support. The three masks to the right highlighted in yellow do not offer forehead support. The headbands on these masks attach to four separate locations on the side of the mask to secure it to the patient’s face. Each mask has a swivel hose connector located on the front of the mask. 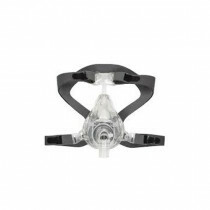 Pressurized air is provided to both the nose and mouth concurrently on each mask. 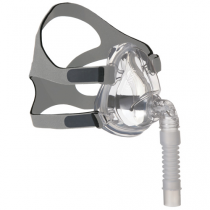 Vitality Medical sells several options of full face CPAP masks for patients with sleep apnea. 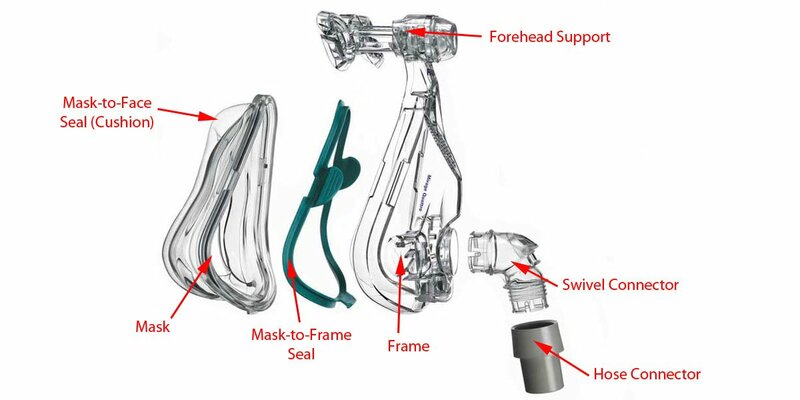 The key components of a full face mask are the mask interface, cushion, mask frame, swivel connector and the headgear. The headgear secures the mask against the patient’s face. The swivel connector attaches to the air supply hose that comes from the CPAP machine. The mask frame houses the mask interface. The mask cushion is attached to the mask interface and seals the mask against the patient’s face. 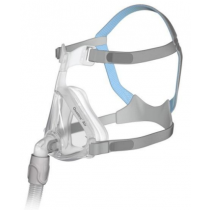 The first step in selecting the best full face CPAP mask is to determine if you require this type of mask. This mask design works best for patients that have nasal obstructions, congestion, or find themselves mouth breathing during sleep. These masks offer nasal and mouth breathing to allow patients to switch their breathing pattern at will. Some of these masks offer a reduced frame size to be less intrusive and provide zero pressure to the forehead. Patients with sensitivity to their foreheads should avoid full face masks with forehead support. 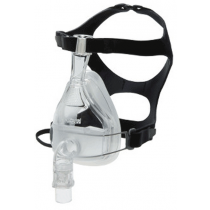 Below is a list of the top CPAP full mask manufacturers. 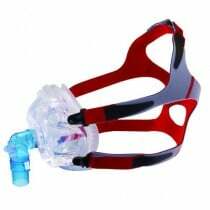 It is a mask designed for sleep apnea patients that provides pressurized air to the mouth and nose. Do I need a Full Face CPAP Mask? If you have congestion, airway obstructions or habitually breathe through your mouth while sleeping, you should consider a full face mask. What is the best CPAP Full Face Mask for a Mouth Breather? The full face mask is specifically designed for mouth breathing patients. How does a CPAP Full Face Mask Work? This mask works in conjunction with an air supply hose and a CPAP machine. The mask directs pressurized air to the mouth and nose simultaneously. The patient can breathe through their nose or mouth interchangeably throughout the night. How Do I Stop My CPAP Full Face Mask from Leaking? Ensure that you have the proper mask size for your face. Some manufacturers provide sizing guides to help you determine the correct size. Also, any trained sleep therapist can help you determine the best size. Next, ensure that your headgear is attached to your mask properly and that the adjustments keep the mask sealed against your face. Your mask cushion should be replaced every three months to ensure that it will seal properly. What is the Most Comfortable CPAP Full Face Mask? Selecting the most comfortable CPAP mask is a matter of first meeting the needs of the patient. Match the characteristics of the patient to the correct mask type. See the guide to CPAP Mask Types and How To Select the Best CPAP Mask for more details. 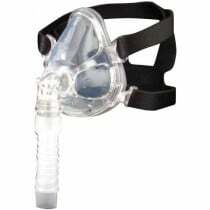 What is the Best CPAP Full Face Mask? The most searched on the Internet and best selling full face mask is the Dreamwear. Kakkar, Rahul K., and Richard B. Berry. "Positive airway pressure treatment for obstructive sleep apnea." Chest 132.3 (2007): 1057-1072.